For a change, I am in front of the camera in character and in costume. I have a small part in a film project being done by Jesse & Will at Ice Block Films. Their shooting schedule spans a full year and mine are the first scenes to be captured. We spent the weekend running around the city shooting my character larking around doing her things while I ad-libbed all of her lines. I am grateful to Jesse for being cool with my spontaneous rewriting of his script. I am a horrible memoriser. 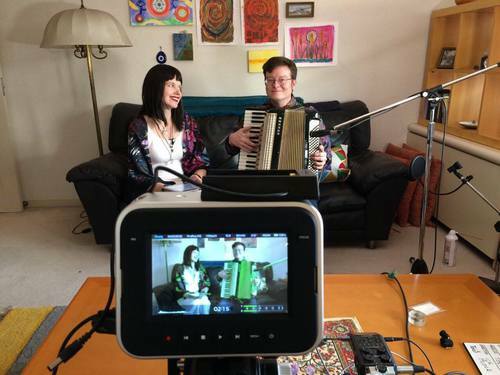 I'm not going to spoil the surprise and tell you anything about the film or my character, but the weekend culminated in an accordion concert in our living room. After we wrapped, Tod made us all dinner. Jesse and Will are usually too busy with their creative work to socialise much, so to have them to myself for an entire weekend was delightful. We chatted up a storm on the trains, over a surprisingly wonderful lunch in Shimomaruko, and of course during dinner at home. It's likely I won't catch up with them again until I help them out behind the scenes on a shoot later this year and I can hardly wait.